Today I gave my self a Christmas present. Before this purchase I did not own a working VHF/UHF Radio. I have a Kenwood TH-78a that I love. It just needs a new battery pack to get me going. I went out following a snow storm and drove 40mi to Lentini Communcations in Berlin CT. which is my nearest “HAM” radio store and purchased the WOUXUN KG-UVD1P Dual Band (144/440) Transceiver. I was a bit skeptical about buying a Chinese branded ham radio that is not one of the big three (Yaesu, Kenwood and ICOM), but I figured the price is right ($130 w/ programing cable) and QST magazine gave it a good review. First impression was not bad. The box looks nice and everything was neatly packaged. If I were to be over critical, I would say that the programing/usb driver CD’s should be regular sized instead of the Mini-CD that was given to me. I like that the battery is fully charged and it includes a drop in charger which I think should be a standard with any handheld that is purchased. The manual just gives the basics and has a lot of engrish so for those who depend on reading a manual rather than trial and error to operate a radio will find it a tad difficult to follow. 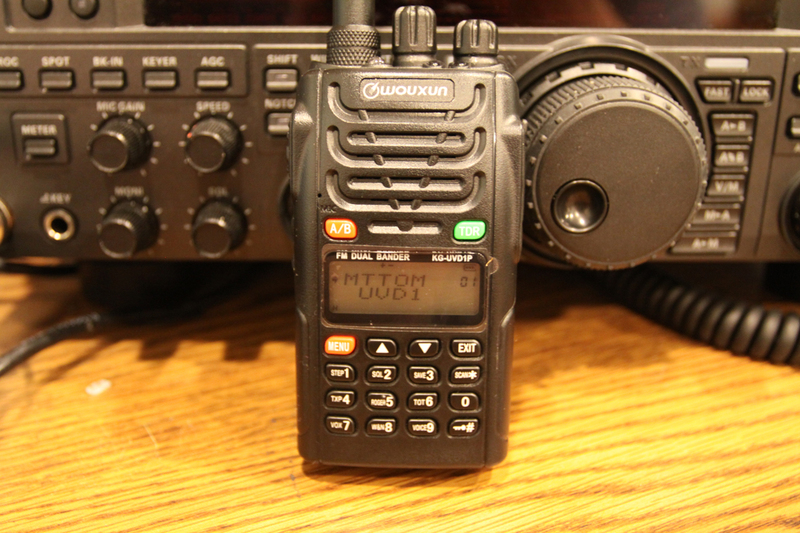 You can also tell the radio is designed for general public use and not for amateur radio but that doesn’t phase me considering I’ve owned Motorola radios which I think they are harder to program. After attaching the battery pack and the antenna, I powered on the unit to hear a voice speaking to me. It took me around 5min to look around, input a frequency, input a tone, set the offset, assign a offset and start talking on a repeater 50 Miles away. I wasn’t crystal clear but I can hear the other station and the other station could make me out. – Not true Dual VFO. You can monitor two freq’s but locks out the other on activity. As of right now I would recommend this to anyone. However I strongly suggest if you purchase this radio to also get the programing cable and software (you can download the software from their website) .